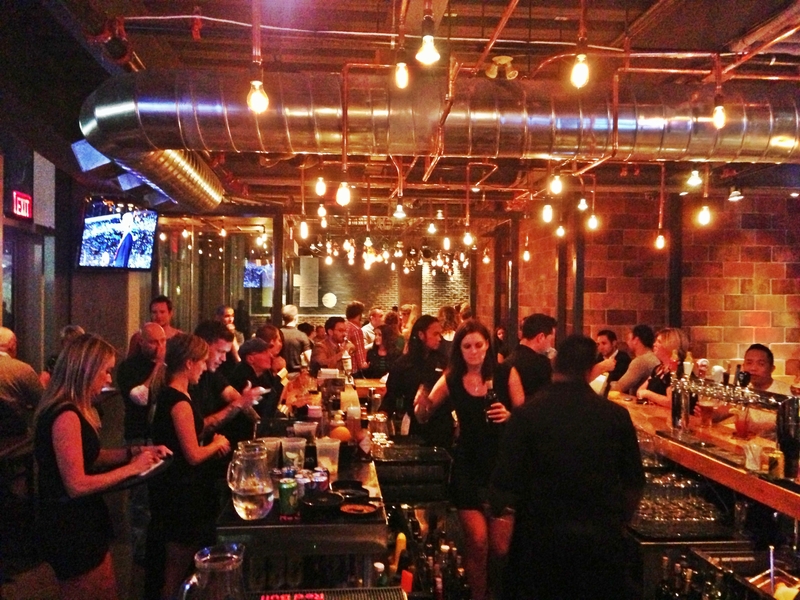 Last night Hunters Landing quietly opened in the Cityplace neighbourhood of Toronto. 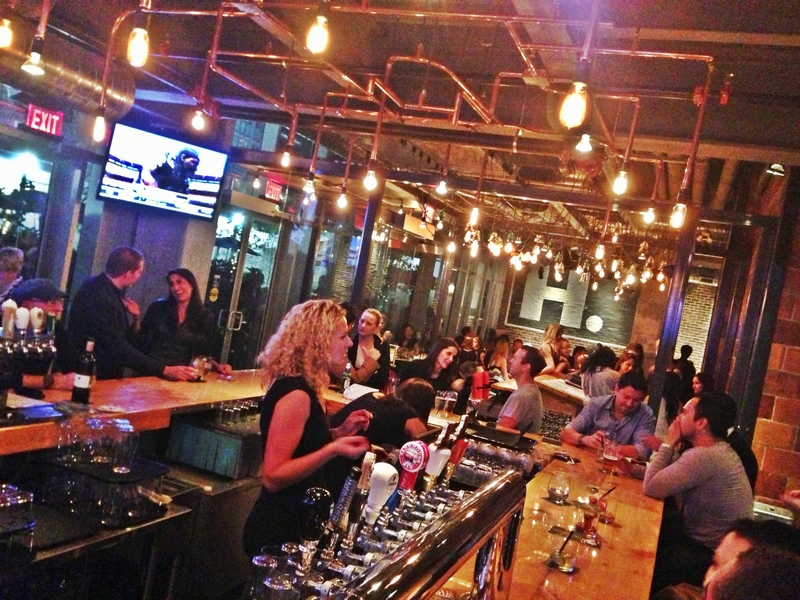 The restaurant wasn’t even supposed to be open to the public, just friends and family, but after watching the Jays lose yet another game in Toronto me and a few friends decided to check it out. I don’t even really write reviews of restaurants on this blog much more, but if there is ever a chance to be the first to review a place in Toronto’s competitive food blogger market, I feel I have to jump at the chance! Hunters Landing is what I guess you could call the sister restaurant to Liberty Village’s notorious Williams Landing. 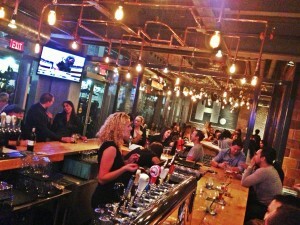 The same company is responsible for bring the once popular South of Temperance to Toronto’s financial core. The decor of Hunters Landing is very modern with lots of exposed brick and concrete with the odd touches of reclaimed wood. I had expected the restaurant to be quite small based on the outside, but with the patio I can see them easily seating 150-200 people. 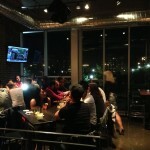 The restaurant has 2 bars, and indoor bar and a patio bar for those warm summer days and nights. 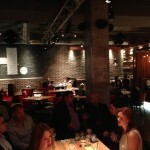 The restaurant has a very cozy feel which will fare well for both summer and winter. Hunters Landing is definitely one of the new places to be seen in Cityplace, which for long has really lacked an identity. It brings a touch of class to the never ending stream of drunken early 20-somethings that feel the need to make a ridiculous amount of noise every time they return from the bars. It adds an element of upper class, to an area that is starting to turn ghetto with all the subsidized housing buildings going up around. The menu is very pizza, pasta, salad and sandwich focused with dishes inspired from all over the world. Prices for apps range from $7-$21 and mains go as high as $32. 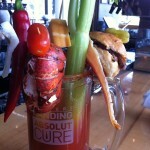 The drink list is pretty standard for Toronto bars, though see the picture of their caesar taken by my friend Chris (below) which looks quite impressive. 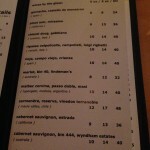 One thing I really liked was their wine list had a bottle of wine for only $24! We decided to split a butchers block pizza ($17) and the asado platter ($21), which is a sharing platter of sausages, steak and cherry-wood smoked mozzarella. 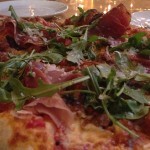 The butchers blog pizza comes stacked high with speck, house chorizo, smoked bacon, agave nectar and organic arugula. It sits on a very nice light airy crust that is very tasty! The pizza itself is nothing mind blowing, but definitely tastes very good. 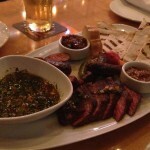 The asado platter on the other hand comes with lamb and chorizo sausage, carne asada, the cherry-wood smoked mozzerella and some flatbread with chimichurri, mustard and several pickled offerings. The cheese and the steak are definitely the stars of this platter, and the sausages, while tasty, are nothing new. This isn’t really a restaurant you go to eat to get blown away by the food, but more of a place you go to socialize with friends, be seen and enjoy very tasty food done well. 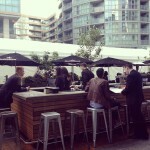 Hunters Landing officially opens today and expect them to be busy! 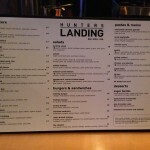 Since I live just a block away I have to say that I am extremely happy that Hunters Landing is now my neighbour. 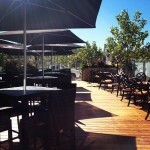 I look forward to many good meals, drunken times and long patio sessions in the near future. Welcome to the neighbourhood!